These two are the art games as best as I can put it. Two very different art games, one more for large scale cinematic imagery and the other more for weird surreal imagery. It’s like comparing Zhang Yimou and Ralph Bakshi. Both are art film directors but of very different art styles. 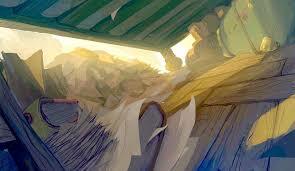 The first is Lost Ember, a game where you play as a silent wolf as protagonist. Rather then being a game influenced by another silent wolf, it’s more influenced by the PS3 game Flower. The wolf is just the body for a murdered man who aims to join his ancestors in a palace in the sky but was lost as his spirit was broken. So he joins with the wolf for his journey skyward granting them powers that they use to progress. The powers are the power to control and become other animals. Need to swim the river? Find and become a fish. Need to fly over the mountains? Become a hummingbird. That’s the how the game goes to the largest extent. Neither Flower nor Lost Ember are the hardest of games. I don’t think there’s a way to actually break the game without properly glitching it or going out of bounds. It’s more for moving about a seeing the scenery, swimming the waters or flying through the clouds. The art design is made in a line style that is a bit of a cross between Flower and Okami, (didn’t think I made that reference off hand did you?). The character and animals are designed in a series of grey and black lines that flex and bend as they move. It’s like a permanent outline drawing or a clay sculpture that as the groves of the sculptors knife still in it. The flowers and scenery on the other hand are more traditionally drawn in a ink/cel shaded style, similar to Flower, but with a more vibrant colour pallet. It makes a good distinction between the animals and the world they inhabit, which adds to the ethereal nature that is set by the story. There’s not much else to say as the the build of the game was early in development (being open in saying things like some dialogue lines where missing or are being replaced) so there still some time to go. There’s also not mush else to say as there isn’t much to talk about regarding the gameplay itself. This is the kind of art game that is designed as an experience, as interactive art so doing a review of the game in the traditional sense wouldn’t do it justice. It’s worth keeping an eye on for the art lovers out there as this one seemed like the next art game that’ll catch the public eye. A game of the Thatgamecomplany ilk. The other game on comparison is one that I have to admit that I don’t know much about. Not the game itself (played the demo and it was good) but on it’s source material, the works of Franz Kafka. The term Kafkaesque is a term that often banded about to describe works like his but even I’ll admit it gets over used. The proper description for it is something bureaucratically fantastical, a bureaucratic system that is so bureaucratic that it’s become fantastical is solving it’s own bureaucracy. My understanding of the idea actually became clearer in the brief talk with the developer as one of his examples of a later level in the game is the perfect analogy; paperwork filing itself. A mundane bureaucratic task completed fantastically. That’s not the only influence from Kafka (if you Google his work as I did to research) as the basis of the story is The Metamorphosis. Considering the game is called Metamorphosis it’s kind of self-evident but like I said I don’t know Kafka. The set up of Metamorphosis is that you wake up one morning and find yourself transformed into a bug. I went with cockroach as it’s about the same size and the imagery makes me think of it. Or that there’s actually quite a few games where you can play as a cockroach so there is now just a default bug in my mind. The goal is to find out why you’ve transformed into a bug, but there’s quite a few side-stories as well, including one that was shown in the demo which is delving into the Kafkaesque world and stop your friend being framed for a crime. The gameplay is first person platforming. The demo was just crawling about the house and your desk, learning to manipulate objects and items in the world, like pushing over bottles and using honey (least I think it’s honey) to get up slippery surfaces. Reading between the lines and from stuff that the developer said, use powers like flying (or at least gliding) come into play later in the game so the platforming puzzles will get more complex as you progress. The interesting thing that they did for the game was a work around for the potential disorientation that some players could have in being a small bug in a giant world, a camera hint system. It lifts the camera to overlook the player and highlights the intractable objects as well as showing your recent movement through a footprint trail. Metamorphosis is in it’s early stages at the moment so it’s probably a while away but the demo was clear in what the game set out to do. And while I don’t know much about Kafka, the style of game they set out to make and the imagery they seem to plan to implement is very interesting. Want to see where this goes.